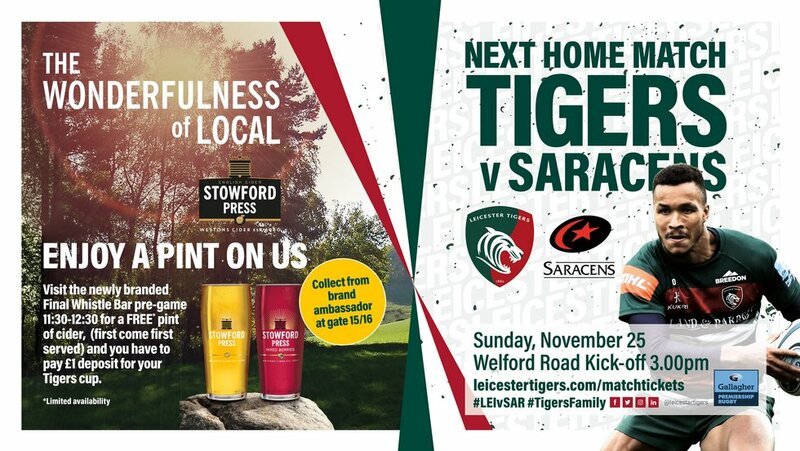 Leicester Tigers’ club partner Westons Cider are rewarding fans with a FREE pint of Stowford Press cider at this weekend’s home Gallagher Premiership fixture against Saracens (Sunday, November 25, 3.00pm). 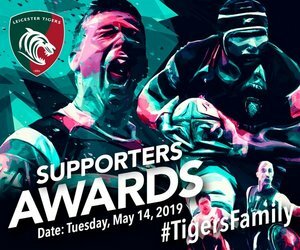 Fans will be able to take advantage of 140 free pints* of Stowford Press Apple or Stowford Press Mixed Berries cider made available in the Final Whistle in the Holland & Barrett Stand at Welford Road. It’s first-come-first-served and, with only 140 pints available, be sure to grab your voucher from our Stowford Press Cider brand ambassador stationed at the entrance to Gates 15 and 16. The offer will only be available between 11.30 – 12.30pm and vouchers can only be redeemed at the bar to the left-hand side as you walk into the Final Whistle - so start your matchday early and have a pint on us! Stowford Press celebrated the launch of their partnership with Tigers by giving away a year’s supply of cider to one lucky fan, Tigers season ticket holder Jon Carter, earlier this summer. Since then, the UK’s leading authentic cider producer has also re-branded the Final Whistle Bar bringing its walls to life with a journey through the beautiful Herefordshire countryside. Take a look for yourself in our gallery above and match tickets for this weekend’s match are still available. Simply get in touch with the ticket office on 0116 319 8888 (option 2) or visit the link below. * 1.There are a limited number of pints available on a first-come-first-serve basis. 2. Fans must show a valid voucher to redeem their free pint. 3. One pint per person 4. A £1 cup deposit is required.